"He played left-handed, a trait which became a cornerstone of his trademark guitar style..."
The Voodoo Stratocaster is a tribute in tone to the voodoo master himself-- Jimi Hendrix. For years players have been putting left-handed necks on their Strats in search of that elusive sound. This only got them halfway there. The Voodoo Stratocaster completes the equation with its completely left-handed string path. The unique string tension created by the Voodoo's reverse headstock, combined with the scorching tone of reverse staggered pickups and the reverse angled bridge pickups-- take it over the top. Combine all that with a right-handed contoured body, tremolo and controls, and you're there. Woven strap and white-coil cable included. Self-taught guitarist James Hendrix met bassist Billy Cox in the Air Force, and they formed a group. In June 1966, Hendrix, now in New York, formed Jimmy James And The Blue Flames, and was persuaded by Chas Chandler to go to London. Auditions were held for Hendrix's backing group and Noel Redding was selected on bass, while John 'Mitch' Mitchell became the drummer. In December the trio released their first single, 'Hey Joe,' followed by the truly dynamic 'Purple Haze' and an astonishing debut album. The Experience enjoyed reverential audiences on America's concert circuit and Axis: Bold As Love emerged in December 1967, completing a triumphant year. Electric Ladyland, the last official Experience album, arrived in October 1968. 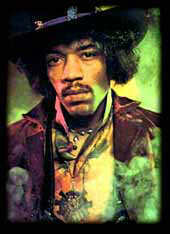 Disbanding the Experience, Hendrix formed Gypsies Sons And Rainbows, who backed him at the Woodstock Festival, where he performed his famed rendition of the national anthem. In October he formed Band Of Gypsies, with Cox and drummer Buddy Miles. They disbanded after three concerts. Hendrix then went to his Electric Ladyland recording studio, started work on a new album, and resumed performing with Cox and Mitchell. In 1970, Hendrix returned to London, where, on September 18th, he was found dead in his apartment. In his brief four-year reign as a superstar, Jimi Hendrix expanded the vocabulary of the electric rock guitar more than anyone before or since. Hendrix was a master at coaxing all manner of unforeseen sonics from his instrument, often with innovative amplification experiments that produced astral-quality feedback and roaring distortion. His frequent hurricane blasts of noise, and dazzling showmanship -- he could and would play behind his back and with his teeth, and set his guitar on fire -- has sometimes obscured his considerable gifts as a songwriter, singer, and master of a gamut of blues, R&B, and rock styles. Widely recognized as one of the most creative and influential musicians of the 20th century, Jimi Hendrix pioneered the explosive popularity of the electric guitar. Hendrix's innovative style of combining fuzz, feedback and controlled distortion created a new musical form. Because he was unable to read or write music, it is nothing short of remarkable that Jimi Hendrix's meteoric rise in the music took place in just four short years. His unique musical language continues to influence a whole host of modern musicians, from George Clinton to Miles Davis, and Steve Vai to Jonny Lang. South Saturn Delta (1997) is a thoroughly researched collection. The detailed liner notes document the fascinating creative processes this virtuoso went through in his native element: the studio. Enlightening moments abound, such as an early instrumental version of "Little Wing". The title track demonstrates an attempt to integrate horns into his sound, reflecting an unrealized desire to eventually head in more of a jazz direction. Includes (previously unreleased) Midnight Lightening and 9 others previously unavailable anywhere! The Jimi Hendrix Official Newsletter Regular updates about official releases, Experience Hendrix Tours and More. Wikipedia Page - photo, bio, album info. There is also an Android guitar app named in his honor: Jimi Guitar. Jimi Hendrix often dreamt of sounds he wanted to bring out through his music. He also associated colors with sounds, visualizing the color purple as jealousy or anger, the color green as envy, and the full spectrum of a rainbow as a special girl in his life. The musical colors painted a 3-D effect of emotions that he wanted to portray throughout his music, much as an artist would use a paintbrush and paint to bring out images they envisioned.